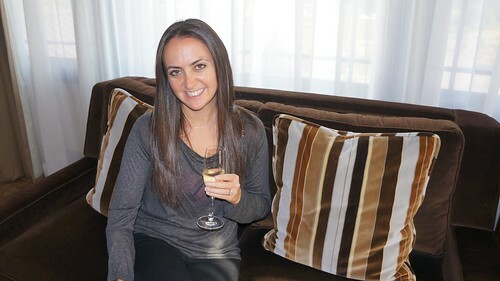 I’m back again with another edition of my personal favorite series on Travelingpanties where I review my favorite luxury hotels that I visit so that you can find out more about it before you book. It’s called Welcome, Mrs. Goldstein. As my regular readers know, I am a luxury expert and my standards are very high so you can rest assure that I am looking at every Five Star Resort with a discerning eye. In this edition, I review the Waldorf Astoria Park City–truly a beacon of luxury in my humble opinion. I was quite excited for my trip to Park City, Utah for many reasons: number one probably being to check out the luxury hotels, which Park City seems to be as famous for as its skiing. We arrived in Salt Lake City extremely late at night after a delayed flight from New York’s JFK (shocking I know) and were quite happy to learn that the hotel was only 30 minutes from the SLC International Airport. When we arrived at the hotel we were greeted by a friendly staffer who was waiting up for us. She had drawn up all the necessary paperwork in an effort to expedite the check-in process for us. We handed over a credit card and signed a paper and were handed our keys so we could get to bed (early AM the next day). As is often the case on many of my trips, I was in town for a press visit for an article about honeymoons that I am writing. When we walked into our room, our airport woes melted away and we were transported to honeymoon central! We were staying in one of the hotel’s residences (Room 7116). We entered the room and landed in a vast kitchen, probably four times the size of the one in my apartment in Manhattan. Sigh. 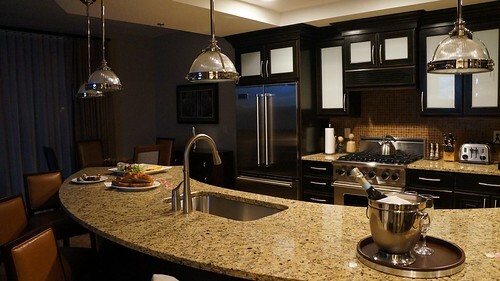 I was blown away: granite countertops, giant Viking kitchen appliances and top-of-the-line accessories–literally anything you might need to make a meal (they will actually go shopping for you and give you a recipe if you do want to cook, which I thought was pretty cool). The kitchen featured a refrigerator, microwave, oven, dishwasher and plenty of dishware. There was also a large deli tray and fresh bread waiting for us–they rightfully assumed we would be hungry after our flight delays. There was also a bottle of Prosecco on ice, which sadly we had to save for the next day. Nothing torments me more than not being able to bust into a bottle of alcohol! But we did have an early morning and I wanted to be fresh to greet the day. The concierge had also left us a thoughtful gift–one of the Waldorf’s own, snuggly blankets. 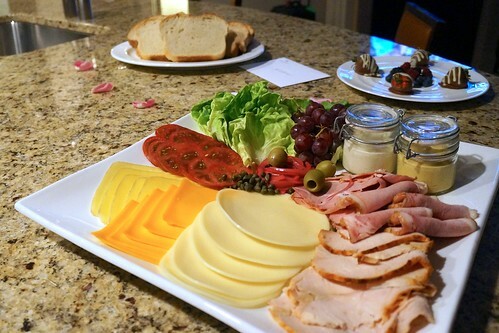 After snacking a bit on some delectable sandwiches (probably the best bread I have ever had), we were off to bed. We entered the bedroom, where the romantic efforts continued–our bed was turned down and covered in multi-color rose petals (a ritual I’m going to require Mr. Goldstein to do each time I return home going forward). 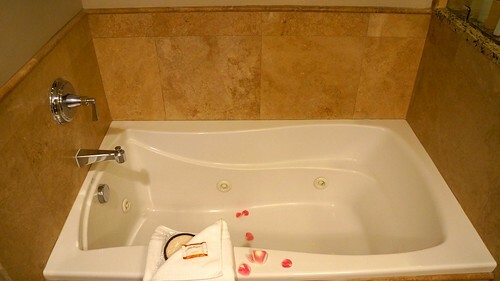 The King bed was calling my name–I could not wait to get in (though I did hate tossing the rose petals on the ground). We fell asleep with the gas fireplace on! I didn’t care if it was summer! I just couldn’t resist! The room also featured a flat-screen TV iPod docking station, and WiFi. When we went to turn in, we realized there were two bathrooms in our room. One in the master bedroom and one in the living room near the front door. 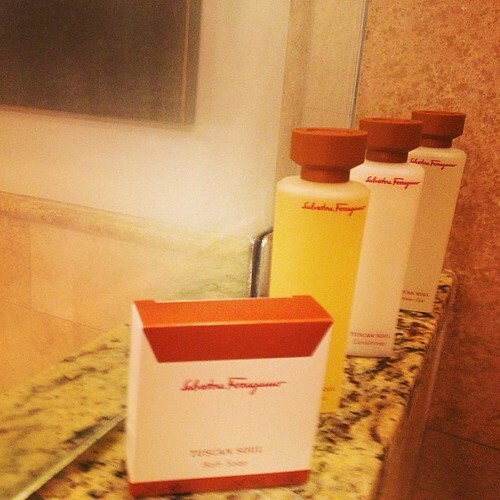 Each was equally as beautiful: covered in marble and stocked with Feragammo toiletries. There was also another Flat-screen TV in the master bathroom, which I made full use of. I tried to savor my two nights having the luxury of not having to share a bathroom with my adorable husband. Now that’s marital bliss. There was also a makeup mirror and a loofah waiting for me– two amenities that I love. 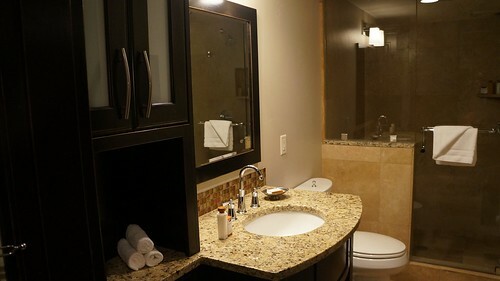 The master bathroom had a nice shower and a oversized jacuzzi! Holler! The next morning I was better able to appreciate my surroundings, the room was furnished in natural colors and plenty of leather, which created an elegant yet casual atmosphere. Enjoying my Prosecco! Thanks, Waldorf Astoria! Oh and I almost forgot to mention the full-size washer and dryer that were tucked away in a closet in the living room. As an NYC resident, you can’t even imagine my excitement! Whether you are looking for an active weekend or hoping to relax and unwind, there is something at the Park City Waldorf for everyone. Skiing access is easy as the resort is located conveniently inside Canyons Resort. Canyons earned a top 10 designation by Ski Magazine and Waldorf Astoria residents have their own private gondola access to the resort’s 9 mountain peaks, 6 natural half-pipes, 5 bowls and three unique terrain parks. Skiing doesn’t get more convenient than this. 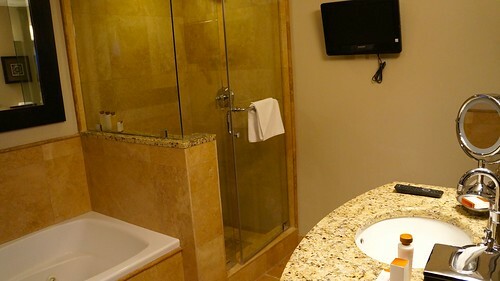 But if you’re hoping to visit Park City Mountain Resort or Deer Valley Resort (two amazing Park City resorts), the hotel has a complimentary shuttle. The hotel’s gondola also provides access to all-season recreational terrain–guests can enjoy hiking, biking or fly fishing. There are also lots of romantic activities like hot air balloon rides or horseback rides. The luxurious amenities at the Waldorf Astoria, Park City are the hallmark of every Waldorf. Perhaps my favorite amenity is the enormous Asian-inspired spa featuring innovative treatments like the Hydrafacial. 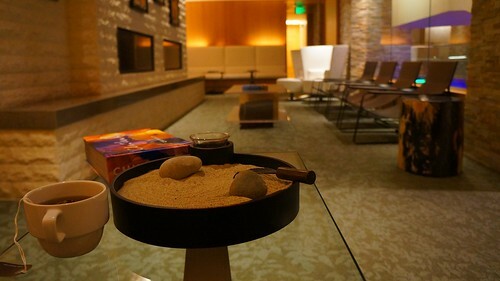 The spa truly is a destination unto itself. There is a 2,000 square foot fitness center, featuring modern equipment. The resort also features a year-round heated pool and hot tubs where guests can unwind and relax either apres-ski or during the summer. Guests can take advantage of poolside service in the summer and stunning mountain views throughout the entire year. I also loved the outdoor fire-pits where guests can congregate and take advantage of the s’mores served nightly. And during the winter we hear their ice bar they have outside is incredible! I’m hoping to get back to check it out for myself! The lobby is gorgeous, minimalist yet classy. 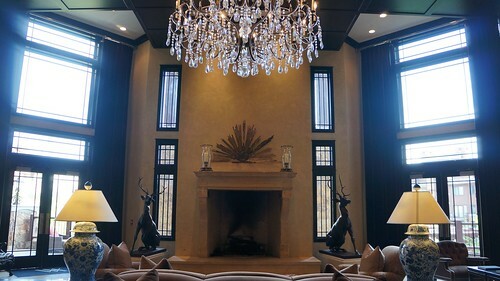 There was a giant fireplace in the center of the lobby, which was flanked by two hand-carved deer sculptures. There are overstuffed rustic-leather couches and chairs and even a table with a chess set. There are high ceilings and an absolutely massive Baccarat crystal chandelier in the center of it all. It’s cozy yet classy–something that only a Waldorf Astoria can accomplish. I could definitely see myself camping out here during the winter with some hot chocolate. As I said above, the Waldorf Astoria Spa, Park City is one of the finest spas in the world (just ask their celebrity clientele). The service in here is wonderful and there is a soothing, zen-like ambiance. I especially loved the running water throughout the relaxation rooms, nothing is more soothing to me than trickling water. When you’re finished, your skin looks better than new (unlike most facials). My skin was blemish free and truly glowing. And I swear–that is a first–usually I am banished to my room for the weekend to wait for the extraction sites heal! I didn’t even have to wear makeup that night when I went to dinner! If you’ve ever had a facial, you know this is beyond unusual. When they showed me my face in a mirror at the end of the process, I felt like it was a dramatic TV reveal of before and after. 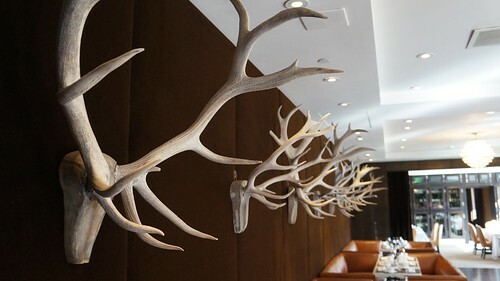 Slopes is the hotel’s fine-dining restaurant and its award-winning chefs have received many accolades for their inventive haute mountain cuisine. They were awarded a four star rating by Forbes Travel Guide and received Wine Spectator’s Award of Excellence. 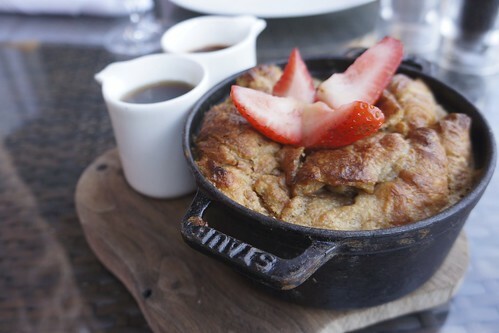 The food is all locally sourced and simply delicious. While there is an emphasis on fresh and seasonal ingredients, dishes are simple and absolutely delectable. I only had the chance to have breakfast here and everything I had was amazing. The blueberry grilled cheese with lavender blueberry syrup was probably my favorite, followed by the French Toast soufflé! Ya know, just a light meal before my day! The hotel also features the Powder Room for those seeking more casual fare, as well as Crave, a small coffee shop that opens at 6am for early risers. Scoop is also the new poolside eatery featuring snacks and specialty drinks year round. 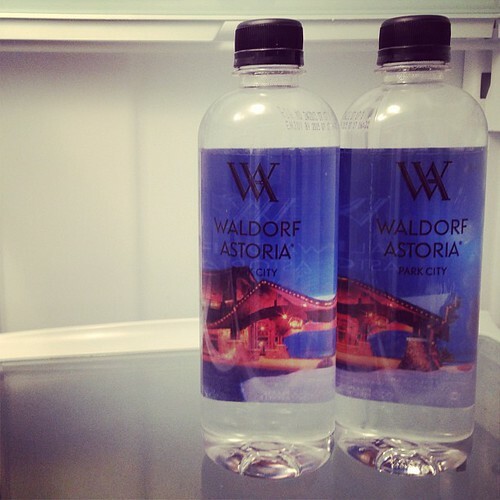 Even the water at the Waldorf Astoria is Luxe! I could not get over the difference in the room rates during peak season and during the summer (pretty much any time other than ski season). Room rates drop significantly from up to $3,000/night to as low as $179/night! So if you’re looking for an affordable luxury getaway, look no further than here. Even if you’re just hoping to chill by the pool and be pampered, I highly recommend a stay at the Waldorf Park City. Plus, maybe it’s my jaded New York pricing, but I didn’t even think that the restaurant was that expensive (for a Five Star hotel). I mean it’s not inexpensive, but the prices are certainly not prohibitive from enjoying a little indulging. The Bi-Level residences are absolutely incredible and a great option for families. They also feature outdoor gas fireplaces on their balconies. 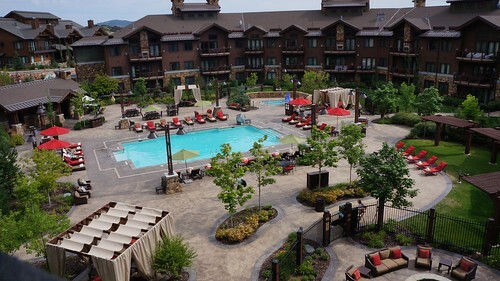 The Waldorf Astoria Park City perfect for those who are looking to experience the ultimate luxurious lifestyle in the majesty of the mountains–no matter what time of year you come. Loved this article! Another recommendation I need to follow! Thanks! The hotel (and the food and the blanket!) looks amazing! Hi Harriet, I will try to be more up front about exactly what is complimentary. Generally on a press trip you pay a media rate for a hotel room, which can vary and meals are comped except for the alcohol. People in the industry generally know this so wrongfully assumed everyone knew this. You can always email me and I am happy to tell you exactly what was given to me complimentary if you’re interested. My opinions are always very honest even when I am given certain things for free.